when stomach acid moves upwards and backwards into the oesophagus or food pipe. Acid Reflux: The stomach acid moves backward and upwards into food pipe . Heartburn and acid reflux are used interchangeably to mean the same problem. GERD: Gastroesophageal reflux disease is a spectrum of condition(includes symptoms,injury or histopathological changes) occurring due to chronic ,regurgitation of acid and or bile from your stomach into the oesophagus. Can children have acid reflux? Surprisingly, yes. GERD has been the number one oesophageal disorder in children of all age group.GER is common in upto 40 to 65% of infants and generally gets better within 12 to 24 months of age. 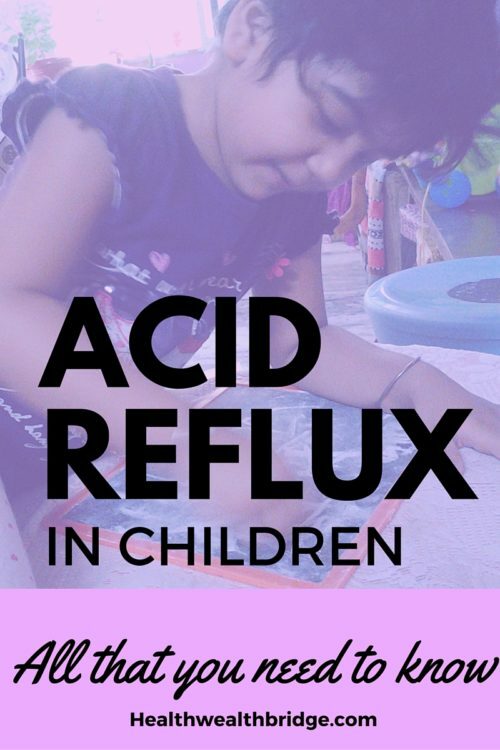 Some amount of reflux occuring occasionally, is normal.Only when the reflux occurs persistently and causes symptoms in the child, it is considered patholohgical.GER causing either feeding problems or breathing problems is sufficient reason for a consultation with your doctor. In infants less than one year, acid reflux is often due to immature digestive system.The physiological sphincter is a muscular valve between stomach and oesophagus ,which generally becomes fully functional by one year of age. How do you know it might be Acid reflux? Feeding problems;refusal to feed, irritability ,arching, choking, gagging, crying during feeds.These are all sign of oesophagitis and are often responsible for inadequate weight gain. cough, frequent and not improving.GER is the third most common cause chronic cough in pediatric patients when infectious causes are excluded and is the most common cause in the 0 to 18 months age group. Older children: may complain of abdominal pain,burning sensation in throat or mouth,sour taste in mouth,burping excessively with regurgitation of food particles in mouth,something being stuck in throat. In very young children and infants, colic,poor growth,breathing problems,sleep issues,recurrent pneumonia are all possible symptoms. Inadequate weight gain and decreased growth.Regurgitation causes loss of calories and discomfort during feeding also cause child to feed less. Erosive oesophagitis may cause bleeding from the oesophagus and present as haematemesis or blood mixed vomit. Iron deficiency anaemia and stool testing positive for blood are indirect proof of microscopic prolonged gastrointestinal bleeding. Very young patients with pain due to oesophagitis may manifest as head tilting,neck cocking,posturing. Respiratory complications: Between 43 % and 61% of children with chronic respiratory symptoms may have coexistent GERD. Apnea,or acute life threatening event is a very serious complication suspected by presence of apnea,change in colour,muscle tone change, choking,gagging. Persistent cough,aggravation of wheezing in children with asthma and hoarseness are often present. History as explained by parents and physical examination .are often enough for your doctor to suspect this problem. Improvement of symptoms following anti-reflux medications is often indirect proof of this condition. pH probe test:24 hour pH monitoring in ambulatory patients ,help to diagnose GER. Endoscopic evaluation: fibreoptic laryngoscopy and oesophagogastroduodenoscopy with or without biposy.Biopsy is one of the most reliable test to diagnose nature and severity of complications of GER. Esophageal manometry:measurement of lower oesophageal sphincter muscle tone is measured. Technetium 99m Scan: this test helps identify reflux and gastric emptying. Video Fluoroscopic Swallowing Study : swallowing coordination and oesophageal motility.Helpful test in cases of respiratory complications like wheezing intermittent stridor. Barium swallow study helps to rule out anatomical problems like pyloric stenosis,malrotation,strictures.It is not diagnostic of reflux. This is the best way ensure long-term benefit to the child and prevent complications. Diet: smaller feeds,thicker feeds,calorie dense feeds,frequent feeds.Food may be thickened with rice cereal.Thicker the feed less is the chance of reflux.These modifications of type of feed helps to decrease reflux,increase calorie intake and improve symptoms. Small volume,calorie dense,thick feeds at frequent intervals is the best way to avoid regurgitation.Donot give water ,milk or any other liquids ,during or immediately after feeds. chocolates,aerated beverages,tomatoes,citrus fruits,fatty food,fried food,mint etc. Decreasing weight in case of obesity is important in all age group. Timing:at least 2 hours need to pass after meals ,before child is allowed to be in supine position.The same time limit is important for exercising and any activity which can increase intra-abdominal pressure. Infants : feed your child with the head and upper end of chest elevated. This you can do by placing a pillow under your folded legs on the left side (that is below your lap).Head of the baby in the crook of your arm and your back having a good support. Head end of the bed may be elevated by 20 to 30 degrees.This is done by placing bricks below the bed at the head end. Prone position decreases reflux and may only be done under supervision for limited duration.However as supine position decreases risk of sudden infant death syndrome American Academy of Pediatricians strongly recommend supine position during sleep. 1)Proton pump inhibitors(PPI):First line choice for treatment .Experience with pediatric dosing and availability of formulations,excellent safety profile ,food and drug administration approval have all made this one of the most popular effective drug for GERD. How it acts:blockage of proton pump in stomach ,with decrease in production of H+ or proton present in stomach acid.This helps in decreasing acid production in stomach. Important to take these medications at least half an hour before meals.Since these are effective from 20 to 22 hours they can be taken once a day.If required twice a day dosing may also be needed. Duration of therapy may be from 6 weeks to 12 weeks. Blocks a type of histamine receptors(H2) on stomach cells. Helps in decreasing acid production . This too has an excellent safety profile. Half an hour before meals and twice a day has the best action. Sucralfate is popular as a protective barrier.In acidic pH sucralfate forms protective polymers and adheres selectively to erosion and ulcers of the mucosa.It is important to give sucralfate before use of either PPI or H2 blockers. 4) Antacids: not popular in children.Long term usage is not recommended as side effects are common.Mostly used as a trial therapy to establish reflux and for providing symptomatic relief. Considered only as a last resort . Patient has GERD induced serious complications. Acid reflux and GERD is one of the most common gastrointestinal problems of childhood.It can largely be treated by modifications of feeding habits,sleep habits and positional therapy. Small volume,calorie dense,thick feeds at frequent intervals is the key to prevent regurgitation. Donot give water ,milk or any other liquids ,during or immediately after feeds. GERD is often associated with upper airway complications and asthma. Proton pump inhibitors are extraordinary effective in treatment of acid reflux and has a well documented safety profile. Improvement of symptoms of GERD often improves airway complications. 1)Mechanisms of gastroesophageal reflux and gastroesophageal reflux disease.Vandenplas Y1, Hassall E.J Pediatr Gastroenterol Nutr. 2002 Aug;35(2):119-36. This is becoming a more prevalent issue. Great summary! Those Proton Pump Inhibitors are pretty cool drugs the way their mechanism works. The result is that there are very few side effects with short-term use. It’s valuable to realize that medications that reduce the body’s acid production can interfere with normal digestion (as the acid is required to break food down. Acid reflux can be really painful and difficult to diagnose in small children. It’s very difficult to diagnose as children can’t really explain.That’s why we as parents need to be aware.Thanks for reading. Fortunately we haven’t had this issue in our family. Good to know the symptoms! That’s great.That means you already have a healthy lifestyle. Keep doing what you do.